As a dietitian working with children, youth, and families for over 20 years, I have observed orthorexia, a phenomenon where healthy eating becomes an unhealthy obsession. Most current nutrition research supports the notion that eating a diet based on whole, minimally processed foods is “healthy.” However, someone who suffers from orthorexia may fixate on the quality of food they eat and worry about “unclean” foods such as packaged or processed foods. This can lead to diets that are so restrictive that nutrient deficiencies arise. So where does healthy eating end and disordered eating begin? The answer may vary depending on the individual. I would say that eating is a problem when enthusiasm for healthy eating turns to an obsession; when planning/preparing food interferes with one’s life (work, school, social, and other endeavours); or when eating is associated with excessive guilt and self-loathing. When a person tells me that they cut out all added sugar from their diets and then they felt much better, I ask them what they ate instead. So if you cut out all cookies, cakes, sugary drinks, and instead eat salads, fruit, nuts, and seeds, then you not only eliminate sugar but you add a lot of fibre, nutrients, and phytochemicals into your diet. It’s hard to determine whether that improved sense of well-being is due to the elimination of sugar/fat/sodium or the addition of nutrient-dense, quality foods. The reality is that healthy eating is defined by both what we include and exclude in our diets. Rather than thinking that a particular food is healthy or unhealthy, what matters is how much and how often you eat that particular food, and then the rest of your diet. The totality of the other foods that you eat matter more than one particular food! That is, one’s whole dietary pattern is more important than one single food. To be healthy, we need to eat a variety of foods, and it is best to vary our meals and snacks. By choosing a variety of foods from the different food groups, you are more likely to get the different nutrients your body needs without getting an excess of any one nutrient. Rather than thinking of a food as “good” or “bad”, I like to think of foods as nutrient-dense, or helping to meet our nutritional needs and improve our health. To avoid a moralistic tone when talking about eating, you could use language such as “Always” or “Everyday” foods versus “Sometimes” foods. Healthy eating differs from restrictive dieting in several ways. 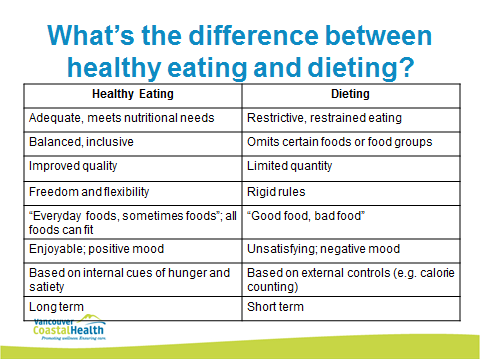 The chart below compares Healthy Eating with Dieting, and you can see that the quality, quantity, purpose, approach and language used differ. Does my way of eating promote health? Is my current approach helping me to meet my goals (what are my goals)? Are my behaviours and attitudes around food consistent with good physical, mental, and emotional health? Health is a resource for everyday living. Being healthy enables us to learn, work, play, and do the things that are important to us. Therefore, eating well helps us to feel good, grow optimally, learn well, and to perform. Food is more than nutrients. Health is more than what you eat. Being a dietitian, I emphasize more nutritious foods such as legumes, nuts, seeds, whole grains, vegetables, and other nutrient-dense foods. At the same time, there is always room for dessert in moderation. It is important to recognize that food is social, cultural, and has many meanings and roles in addition to promoting physical health. Food nourishes, strengthens, and connects us. Both how and what we eat are important to our overall health. Helen Yeung is a Public Health Dietitian with Vancouver Coastal Health. She holds a Master’s degree in public health nutrition, is a clinical instructor in the UBC Dietetics Program, and is part of the North Shore Education Committee for the Prevention of Disordered Eating. 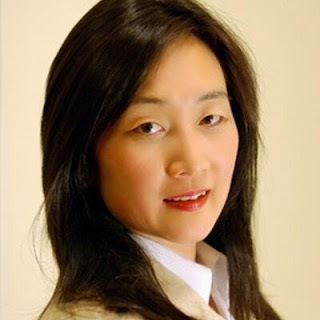 Yeung helps promote healthy eating with children, youth, their families, and communities.